Another project my Goddaughter Amber and I did for her "lil" was a tumbler. I did a couple of different designs and Amber decided on the one she liked best. Ya know when you are a crafter like I am you have to love the ability to do internet searches and find ideas! I can't remember what website this idea came from but I was glad I found it. Amber and I agreed it was the better of the ones I had found and would be great for the tumbler. I also have to say again *okie thinks she says it way too much but will continue to say it* I LOVE MAKE THE CUT! There is no way I could have designed this in the short amount of time I did if I was still using the Cricut cartridge method, nor would I have been able to do the "curve" that the tumbler needs for the image to go on straight. Here is the tumbler finished. 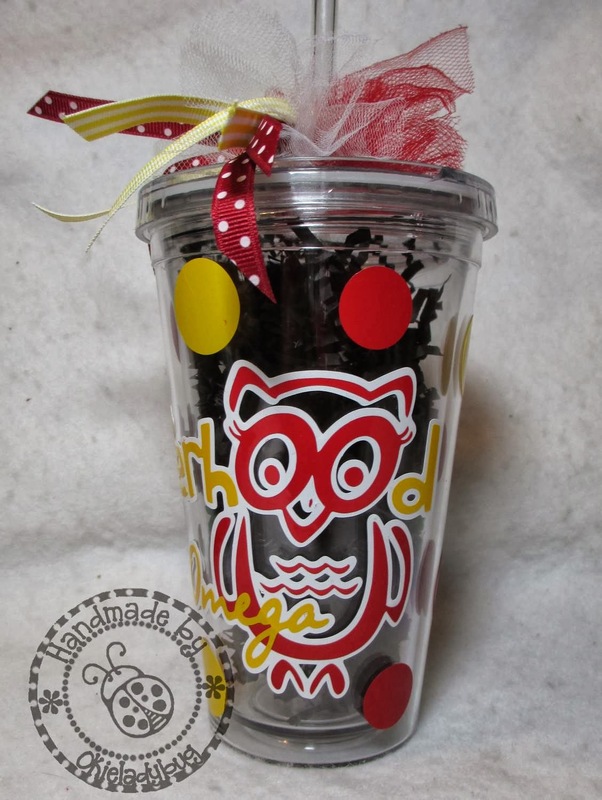 We decided to add some vinyl polka dots to the tumbler for some added color. I hit my ribbon stash and added some stripped and polka dot ribbon with a little tulle to dress up the straw. In order to see the images easier and for the purpose of presentation I added a little bit of black shredded paper to the inside. Amber was very pleased with the tumbler and joked about keeping it for herself. Of course we can make her one...hmm, I'm thinking Christmas present! Her "lil" will have to hang on to this or another Chi Omega will swipe it. This turned out really cute and I like the ribbon tied on the straw. Brilliant! It will be a one-of-a-kind, and I bet it will be treasured. You are so creative. wow I just love your tumblers!!! What kind of vinyl do you use on them. 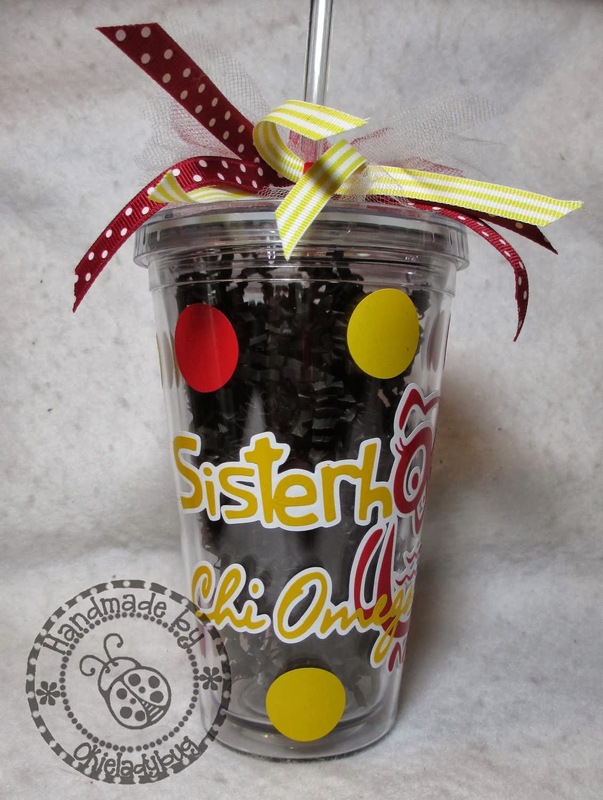 (I'm sure you've posted so I'm sorry for asking) So glad my daughter is two years out of school or I would have to be making these for her "sisters"!!! I made some cup holders for her and her friends with vinyl her first year after graduation for home coming.. Oh my the weeding on all those words on 8 cups! Are you selling the file? I would love to make one for my daughter. Candy I usually don't sell my files but offer them for free. If you will email me at okieladybug at swbell dot net then I will send you the file.